Blue Diamond Pools and Landscaping offers unique and inspired landscape designs executed by our professional crews and expert craftsman. With a commitment to outstanding customer service, we make backyard dreams reality with high-quality pool and landscape installations of any size – from large resort to small suburban residential projects. Blue Diamond is passionate about building the most impressive backyards with creative designs, high-quality materials, and white glove customer service. With over 17 years of experience in the pool and landscape industry, we are experts in the construction and renovation of all pool types including concrete, vinyl and fibreglass. Indulge your spirit. Find your escape. We love our clients, and aren’t afraid to put their words in place of ours. Installing an in-ground pool is a major project and investment and we wanted to do it right. So based on a friend’s personal experience, local company reviews, and recent awards given, we chose Blue Diamond Pools, and were not disappointed.
. . . We found the entire team at Blue Diamond Pools to be very friendly, courteous and prompt and most importantly, after the installation was completed any questions or issues were promptly addressed. We would highly recommend Blue Diamond Pools to anyone who is contemplating a pool purchase and installation project. I would like to thank Mark, Chase and their team for making my dream backyard come true. Blue Diamond was very pleasant to work with, and both Chase and Mark were always available to address any questions or concerns along the way. … I would definitely recommend Blue Diamond Pools to anyone looking to benefit from a quality, elegant pool!! I have been living in Bolton for 6yrs and never once used my backyard & existing pool. After meeting Chase through a friend and talking over some of my ideas and his suggestions, my gut feeling was to go with Blue Diamond Pools. I went with my gut and no regrets. We would like to commend and recommend Chase, Mark and the team at Blue Diamond Pools & Landscaping! . . . We are so happy with the work that they did on our pool. It looks brand new and fabulous! Chase and Mark were extremely professional providers. They offered valuable suggestions and created a product that I am very pleased with. In addition, they made efforts to deal with problems that ensued (due to weather) and were diligent in resolving issues to my full satisfaction. I would recommend Chase and Mark for any pool project. 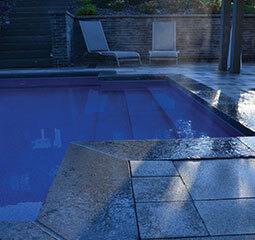 If you are thinking about putting in an in-ground pool this year or in the near future choose Blue Diamond Pools. We had an awesome experience with Mark, Chase and the team, and our pool is our summer haven. 17 years adds up. Click below to learn more. 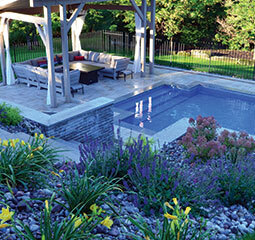 Installing an in-ground pool is a major project and investment and we wanted to do it right. So based on a friend’s personal experience, local company reviews, and recent awards given, we chose Blue Diamond Pools, and were not disappointed. From our first appointment with Chase to interacting with each team on site under the supervision of Andrew and Mike, to getting to the end product and having photographs with Mark, it was a very positive experience. All involved were professional, friendly, and responsive, and we appreciated how they patiently listened to and answered our many questions. We were especially impressed by how quickly our emails or telephone messages were returned when we had questions, even after the pool was completed, and how quickly someone was on site to address our concerns. Interestingly, as we chose certain materials for the pool with various companies, we were often asked who was installing our pool, and when we said Blue Diamond, the response from them was always a positive nod, and that we were getting the best in the business. It is fun to hear the comments of those who now see our back yard: wow, gorgeous, it’s an oasis! More importantly, we love it and are thoroughly enjoying our new pool. We happily recommend Blue Diamond Pools. During the early Spring of 2012 and after many years of summer vacation cottage rentals we started to envision our own backyard as a private oasis with a pool surrounded by rustic limestone landscaping as well as a cabin like structure next to the pool area. It would be like having our own lake and cottage atmosphere without having to drive anywhere! As first time prospective pool owners we conducted extensive research on which type of pool to own and concluded that one made of fiberglass would best serve our needs. Coincidently, we had also read an article in a magazine about a local award winning pool company, Blue Diamond Pools, who specialized in the installation of fiberglass pools. We had contacted several other companies but Blue Diamond Pools were the only company that actually took the time to come out to our home to assess our individual needs in relation to what size and shape of pool as well as the best location for it in our backyard. Chase, Mark and the team were extremely efficient as the pool installation process was commenced and completed right on schedule. We found the entire team at Blue Diamond Pools to be very friendly, courteous and prompt and most importantly, after the installation was completed any questions or issues were promptly addressed. We would highly recommend Blue Diamond Pools to anyone who is contemplating a pool purchase and installation project. I would like to thank Mark, Chase and their team for making my dream backyard come true. Blue Diamond was very pleasant to work with, and both Chase and Mark were always available to address any questions or concerns along the way. Our goal was to have a salt water vinyl- lined pool, visually designed to look like a concrete pool. Thankfully, we were able to achieve just that and I am absolutely thrilled with the look! Being situated in the country we were initially concerned about animals; however, our automatic pool safety cover is the perfect solution for such a thing. We also appreciated Chase’s suggestion to insulate the bottom of the pool for heating purposes. In doing so the pool remained warm all summer long, and we rarely had to use our pool heater at all! I would definitely recommend Blue Diamond Pools to anyone looking to benefit from a quality, elegant pool! I have been living in Bolton for 6yrs and never once used my backyard & existing pool. After meeting Chase through a friend and talking over some of my ideas and his suggestions, my gut feeling was to go with Blue Diamond Pools. I went with my gut and no regrets. I went to a salt water pool, all new equipment, new vinyl liner, concrete pool deck, concrete patio mixed with armour stone boarder. It was great working with Chase and Blue Diamond Crew, with their attention to detail and incorporating some of my ideas with their own and making it work. I would recommend BLUE DIAMOND POOLS to anyone. If you are thinking about putting in an in-ground pool this year or in the near future choose Blue Diamond Pools. We had an awesome experience and our pool is our summer haven. I can tell you this: not only was the pool install great (hole dug/liner installed/pump working) but we had poured concrete stamped around the whole perimeter. 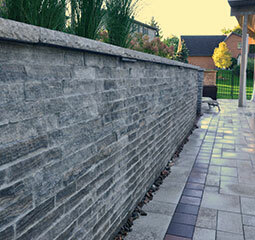 People in the concrete business have seen our walk around and are impressed. We are asked all the time…who put the concrete in? Most impressive was that these guys showed up when they said they would. They did not leave a big hole in our yard and go on to other jobs. This was started at the end of June and we were swimming in the pool mid-August. No wasting time!